The Tetra Cube Aquarium Kit is a small fish tank, for people who have never owned fish before - with a classic cube look. It is a portable tank when compared with other tanks in its category. It is ideal for offices, hostels, classrooms and any private space. The tank comes with a lid that allows for easy access and cleaning of the tank, and there is also a feeding hole in the cover which is used to feed the fish. It has a good LED light which replicates day and night effects seen in the sea and also beautifies the fish tank. It has a whisper power filter, tetra whisper bio-bag and it's power consumption are minimal. One of the unique features of this aquarium is the blue LED light that makes it stand out, wherever you place the tank. This light arrangement looks really attractive and it has the ability to add appeal to your living room or office. These LEDs ensure catchy daylight effect and can also help low light plants to grow well. 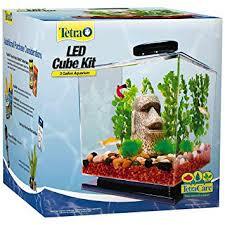 The Tetra Cube Aquarium is a 3-gallon tank that is made up of fine quality plastic material and has a pedestal base. It provides enough space to fish inside and takes up small space in your room so that even apartment style houses can maintain their decor. This Aquarium is best suited for very small tropical fish or 1 Betta fish. This well-designed aquarium comes with a patented Tetra 3i filter module that works with a Tetra Whisper Bio-Bag type cartridge. It can take out all the chemical components and toxic elements out of the aquarium and ensures good health of your fish. You only need to spend a little time for maintenance and cleaning of the filter; it works well for the long run. This aquarium kit has a feeding flap on Lid that assists homeowners to feed their fish with ease. There is no need to open the whole lid to add food for fish, use the flap. One of the most unusual aspects is that the Tetra Cube Aquarium is an acrylic tank that does not make it as heavy as glass aquariums. Comes with the basic things needed for a start up. Price is cheaper than similar spec tanks and it comes with a pedestal. You do not need a lot of space with this aquarium. Perfect for small tropical fish including goldfish and betta. Some customers remarked about the poor fit and finish of their tank. The Tetra Cube Aquarium Kit is a small yet capable acrylic tank to keep your goldfish or Betta Fish.An ideal tank for anyone who just wants to keep 1 or 2 fish.